If you get off the 6 train at 116th St looking for Dinner, from your vantage on the corner you may think the locals only eat pizza, fast food, and Mexican. 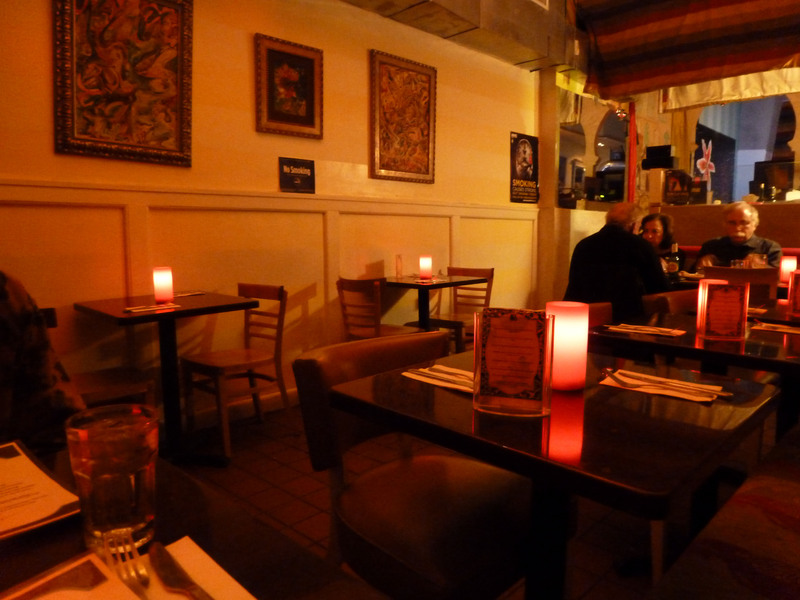 But, walk one block West on 116th St a bit past Park Ave, and you’ll find a tiny, unassuming Moroccan Restaurant, Bar, and Hookah Lounge that feels like it should be on the Lower East Side. Low key in its signage and name, The Kiosk is one of the best places in the neighborhood to experience the big, bold flavors of Moroccan cuisine, have a few drinks, or puff on a hookah. Hungry for something different on a Saturday night, Keith and I trekked over to The Kiosk for the first time in years. When you arrive at Kiosk you can choose to have a hookah and drinks at the front tables, or have dinner in the back dining room. Both areas are faintly tattered, yet comfortable; with décor that is reminiscent of the images conjured when one reads The Alchemist or daydreams about taking a caravan trip across a desert. 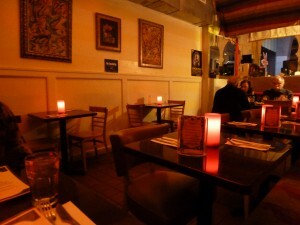 The food, which is delicious and might qualify as adventurous to some, delivers on the promise of big bold spices and flavors for which Moroccan cuisine is known.The Kiosk provides original, well executed, and extremely tasty dishes made with interesting cooking techniques that you won’t find anywhere else in Harlem. 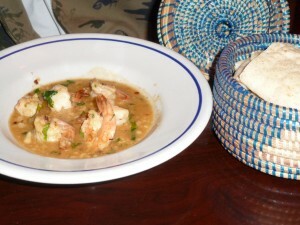 Out of everything that we had, the Garlic Shrimp Appetizer was the tastiest. 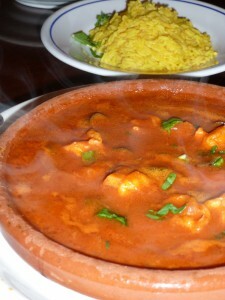 Served with a basket full of warm fluffy pocketless pitas (called Bautbout), you can soak up the intensely citrus sauce textured with garlic chunks and a bit of heat, once you finish the tender tail-on shrimp. 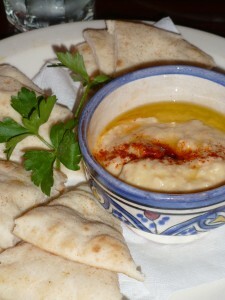 We ordered the Babaganoush (roasted eggplant puree) as our second appetizer, and it was very good. A cup full of smoky and creamy eggplant puree with just the right amount of charred-on-an-open-flame flavor and topped with rich and fruity olive oil, this too was severed with perfectly warm and fluffy pocketless pitas. After these appetizers I would have been content to make a meal of them, which I plan on doing the next time I go. 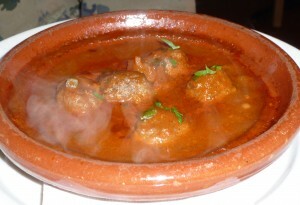 We ordered the Kofta Tajine and the Shrimp Tajine as our entrees, and fell in love with the Tajine sauce. 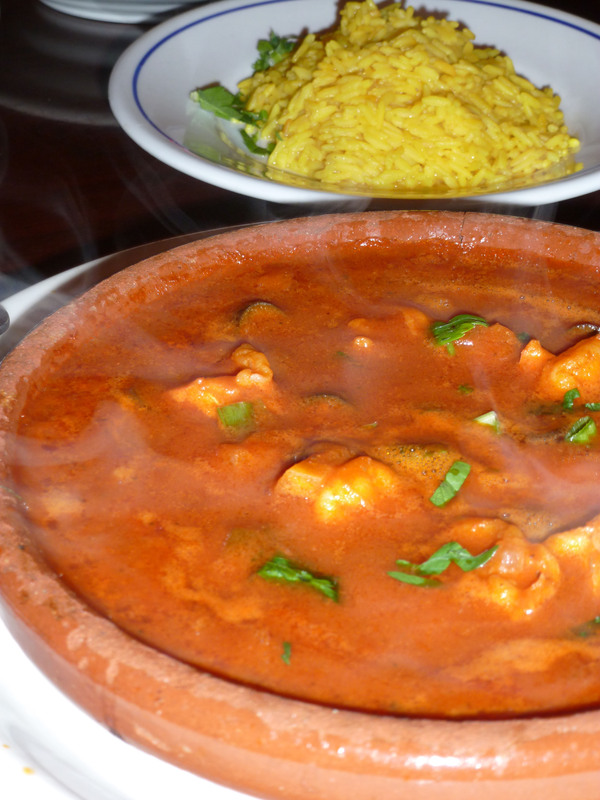 A thick tomato based sauce with hints of Moroccan spices and black olives scattered throughout, we poured the sauce over the accompanying yellow rice and love the combination. Unfortunately, the meatballs were a bit chewy and the shrimp were slightly overcooked, but the flavors were on point and the plates came out steaming. From the sampling that we had (and from the couscous and hummus dishes that I have had previously) The Kiosk would be perfect for a tapas version of the Cheap Eats Happiness as well. This entry was posted by Arionna on Thursday, November 29th, 2012 at 7:51 am	and is filed under Harlem, Manhattan, Moroccan. You can follow any responses to this entry through the RSS 2.0 feed. You can leave a response, or trackback from your own site.